Crimson Tide dominate 'unfamiliar' Spartans from the start en route to lopsided home win. The Hillsboro girls weren't themselves Tuesday night, Dec. 18, in their crosstown rivalry game at Glencoe High School, and the Crimson Tide took advantage of it. 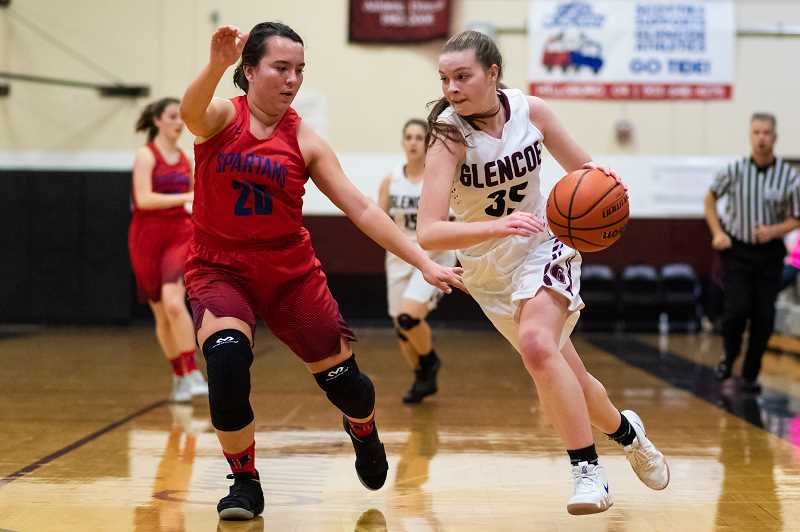 The home Tide used a balanced attack led by feisty sophomore guard Bella Martinez and junior post Brianna Ball, with help from Morgan DeBord, Elizabeth Anderson, Breauna Van Dyke and a number of other Glencoe contributors to beat-back the shorthanded and relatively anemic Spartan attack, 55-28. Playing without standout guard Kylie Fernstrom for the entire first half and much of the game due to injury, Hillsboro had a hard time finding offense, and as a result appeared out of sorts to the Spartan faithful in attendance and their coach who was nearly at a loss for words following the game. "We were a step behind, were a step slow, and no one really stepped up," said frustrated Hilhi head coach Sara Harsin. "That's not the team I saw this summer, that's not the team I see in practice, it's not a team I'm familiar with." Hillsboro's Dylan Kem scored 15 of their 28 points, including all 12 of their first half points. But despite the sophomore guard's performance, the Spartans were lost without Fernstrom, which caught Harsin by surprise. "I think our youth showed a bit tonight," said the coach. "We did not do well. We needed someone to step up and no one did. Dylan had a good first half, but they keyed on her in the second half and no one picked up the slack." Meanwhile, the relatively young and inexperienced Crimson Tide were grinding out baskets in transition and with second-chance points. 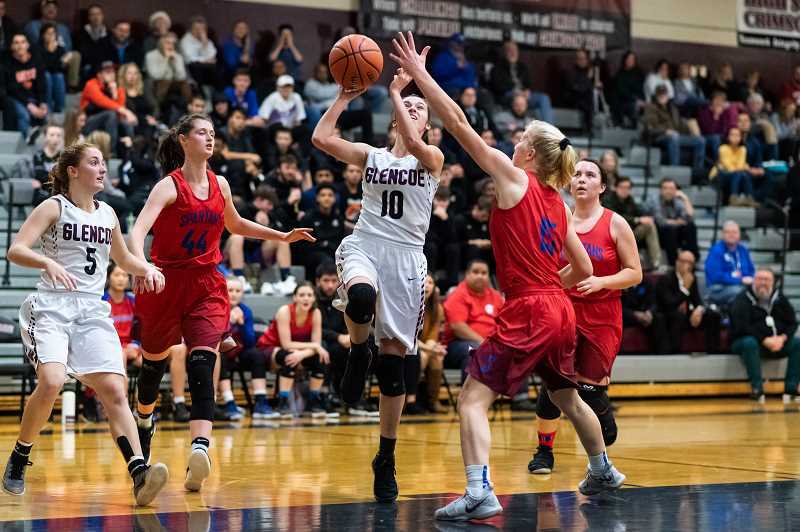 Glencoe outrebounded Hillsboro 46-30 and had three players, Ball, Anderson and Martinez, grab at least seven boards, and that, coupled with the diversity in scoring options, left Tide head coach, Kassi Conditt, feeling encouraged about her team and their prospects going forward. "I feel like we're getting there," Conditt said. "We've played some tough teams so far, but we've played them tough. We're starting to share the ball and taking the ball to the basket, which is something that we've been talking about a lot." Glencoe was a senior led team last season and as a result, this year's team has had to adjust to losing their primary scorers. Conditt believes they're getting there, but also understands that as part of the process, both experienced and younger players have had to alter their playing style. "We've definitely been making adjustments," she said. "We relied heavily on the seniors we had last year and we're just now starting to figure out which kids are going to step up and fill those roles. But they've figured out that it's going to have to come from all of them, and we're going to have to play more of a team game to replace that offense." Martinez is one of those younger players being asked to do more, and at least on this night, was up to the task. The 5-foot-6 guard did a little of everything, scoring 11 points and grabbing eight rebounds, while tallying eight steals. "Bella was very tentative last year in her spots as a freshman, but she's tenacious and has been more aggressive this season, and has a fire that the girls can rally around," said Conditt. "Watching her and Morgan in the press together is pretty fun to watch." The Tide led by six after one quarter, by eight at halftime, and by 22 after three quarters, thanks to a 22 point third quarter effort that came on the heels of consecutive Hillsboro baskets that'd cut the Glencoe lead to three. From there it was all Tide, whose lead grew to as much as 28 thanks to a continued effort on both ends of the floor, this time from the Glencoe bench, with contributions from Kylie Tidwell and Mallory Confer. Now, as the nonleague season begins to wind to a close, the Tide will begin focusing on the upcoming league season, which Conditt and her players are anxiously awaiting. "I definitely think the league season will be exciting," Conditt said. "The girls have talked about how their goal is to win the league, and that's something they know they're going to have to work for." And where do the Spartans go from here? "I think we have to learn from it and get better, or else it's a waste," said Harsin. "I'm ready to go to practice tomorrow and figure this out."